Generic Xamarin.Forms app lifecycle? Platform-dependant! SQL Database and API in Xamarin Forms. Xamarin.Forms makes it possible to create iOS, Android, and Windows apps with large amounts of shared code, including UI code or XAML UI markup. App pages and views are mapped to native controls on each platform, but can be customized to provide platform-specific UI or to access platform-specific features. After successfully installing Xamarin as described in the first example, it's time to launch the first sample application. Step 1: Creating a new Project. Now simply right-click the project you want to start (HelloWorld.Droid or HelloWorld.iOS ) and click Set as StartUp Project . Then, in the Visual Studio toolbar, click the Start button (the green triangular button that resembles a Play button) to launch the application on the targeted simulator/emulator. Xamarin.Forms is a cross-platform natively backed UI toolkit abstraction that allows developers to easily create user interfaces that can be shared across Android, iOS, Windows, and Windows Phone. The user interfaces are rendered using the native controls of the target platform, allowing Xamarin.Forms applications to retain the appropriate look and feel for each platform. 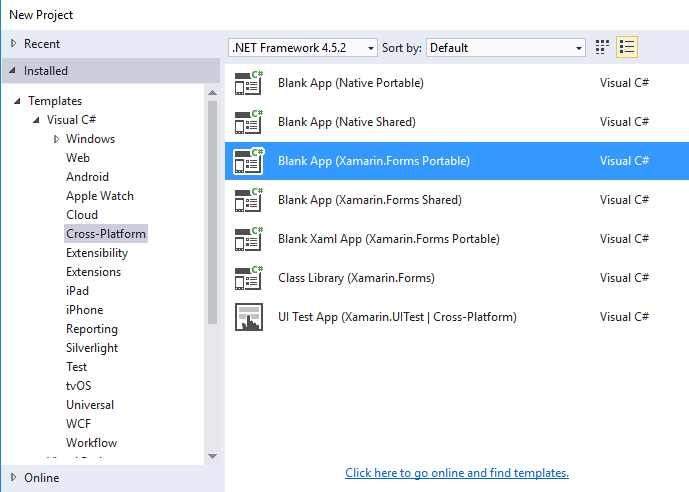 To get started with Xamarin.Forms for Visual Studio you need to have the Xamarin plugin itself. 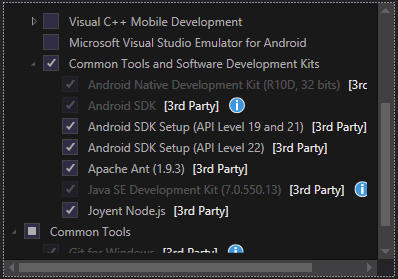 The easiest way to have it installed is to download and install the latest Visual Studio. Uncheck it if you already have the SDK installed. 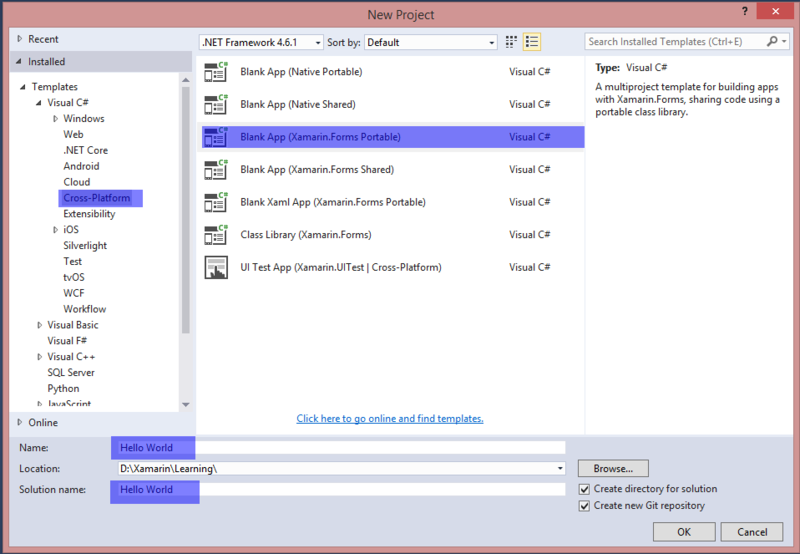 You will be able to setup Xamarin to use existing Android SDK later. for all of your initial assemblies (for example MyProject, MyProject.Droid and MyProject.iOS). As you can see there are 2 available options to create the blank app -- Portable and Shared. I recommend you to get started with Portable one because it's the most commonly used in the real world (differences and more explanation to be added). After creating the project make sure you're using the latest Xamarin.Forms version as your initial template may contain the old one. Use your Package Manager Console or Manage NuGet Packages option to upgrade to the latest Xamarin.Forms (remember it's just a NuGet package). While the Visual Studio Xamarin.Forms templates will create an iOS platform project for you, you will need to connect Xamarin to a Mac build host to be able to run these projects on the iOS Simulator or physical devices.